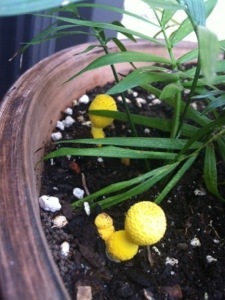 Not sure why but this particular houseplant that I’ve brought out to summer on the deck has a penchant for attracting bright, unusual mushrooms. These just popped up since last night. I realized I should snap them before they go. The last ones – odd looking fellas – lasted barely a day.